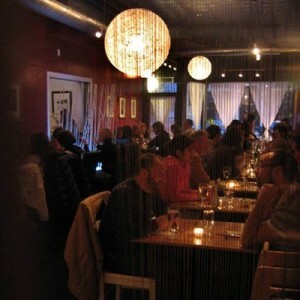 Indie Cafe is one of my favorite restaurants on the North side of Chicago, if not my hands-down numero uno. It’s certainly my favorite Thai place. While sitting in Indie Cafe, whether it’s with Guy or a group of girlfriends, I often notice a certain bustling energy. There is, for lack of a better word, a scene. It’s clear that everyone in the room loves being there. Although Indie is low key, the decor is quite stylish, with cool artwork and romantic lighting. The food is so artfully presented and delicious, it’s hard to believe it’s so affordable. Everything about being there says high-end dining. Everything except the prices. Generally, I order from the Thai menu, though their sushi menu is equally large and impressive. My friends who order the sushi are addicted, but I find the Thai curries to be totally irresistible. The Panang and the Indie Signature Curries are at the top of my list. Both are nutty and intensely flavorful; the Panang is a bit spicier. Guy doesn’t like curries very much. More for me, sucka! The crab rangoon is also top notch – and this from a girl who doesn’t eat much seafood – as is the Tom Ka Kai, a sweet and sour coconut broth soup. I substitute the chicken with tofu. For dessert, try a mochi ice cream ball. My favorite is the green tea. And, if you still need convincing, Indie is BYOB so you can stop in the nearby Dominick’s or the liquor store around the corner and grab a bottle or two. I don’t have a single complaint about this gem of a restaurant. I love it so much; maybe I’ll marry it. I like when we get Indie as take-out. They serve good Thai food, but when I’m in there I feel like they’re trying to play dress up. Let me explain, because I don’t want to suggest that they’re food isn’t good. It’s excellent. I almost always get pad thai or chicken fried rice. And my preference for those two colors my experience. Pad thai and chicken fried rice are comfort food. They’re great as take out. When I eat them in a restaurant, I like it when the setting is as low key as the meal. While the ambience is nice at Indie, it’s unnecessary in my mind. Of all the Thai take out I’ve had in Andersonville and Edgewater, Indie has the best. Last time we ordered it through GrubHub (which is a great website that lets you order food online; but you already knew that right?) and it came quickly and was delicious as usual. And when I eat it in the comfort of my home, the ambience is just right. This entry was posted on Saturday, March 27th, 2010 at 10:30 pm	and is filed under Asian, BYOB, Edgewater, Japanese, Roger's Park, Sushi, Thai. You can follow any responses to this entry through the RSS 2.0 feed. You can leave a response, or trackback from your own site.